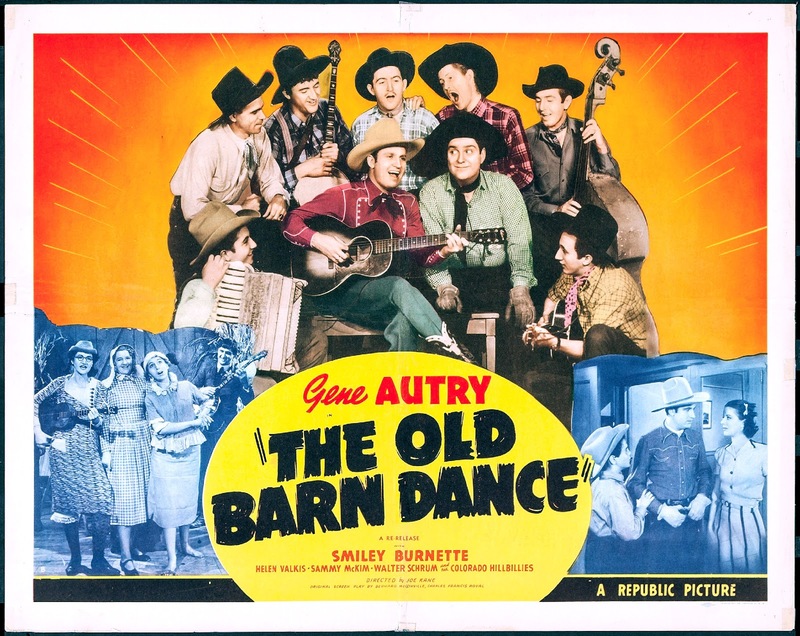 I watched Gene Autry’s 1938 “The Old Barn Dance” not long after learning that “The Fate and the Furious”, installment #8 of the venerable high-octane franchise, would have a run time of two hours and forty minutes. It’s a plague on all our summer movie houses, these obnoxious run times, wreaking of self-importance and questionable editing. Perhaps movies of now should take a page from director Joseph Kane who manages to incorporate nearly everything he needs into “The Old Barn Dance”, ranging from a stampede to a shootout to a chase to a pair of comic brawls, in less than sixty minutes. Granted, the romance between Gene Autry and Joan Valerie’s character is never given proper time to bloom just as Gene Autry’s character has no real backstory to speak of. But then, Gene Autry’s character is Gene Autry. That’s his name – Gene Autry! This is brilliant! Maybe Hollywood should cut it out with all the brooding backstory that is fashionable these days and simply give in to movie star wattage. Why does Angelina Jolie have to be anybody? Why can’t she just be Angelina Jolie as Angelina Jolie saving Earth from plunderous aliens? Lord, that’s a movie I’d watch. “The Old Barn Dance” opens by reveling in Gene Autry’s movie star wattage as he and his cattle train roll into Grainville, with an uncovered wagon filled not with supplies but an actual orchestra, one lending Autry accompaniment as he waves and croons from the saddle, prompting the entire town to stop what it’s doing and just enjoy this free show. He plans to put on another free show later, announced by his requisite sidekick Frog Millhouse (Smiley Burnette) - who gets a scrumptious Ron Swanson-ish ditty as the movie opens about bacon - which will precede an auction of their horses. Why can’t entertainment and commerce go hand in hand? Much of “The Old Barn Dance” does involve commerce, in fact, as Grainville, we quickly learn, is ruled by Mr. Thortnon (Ivan Miller), not so much with an iron fist as a manipulative grin. He owns the new-fangled tractor company, getting all the town’s farmers to give up their horses for his mechanical beasts instead, pitched at prices the farmers can’t possibly afford so that when they can no longer make the payments to the bank, the bank, naturally in cahoots with Mr. Thortnon, can re-possess those tractors and all that cold hard cash can flow relentlessly back toward he who owns it. This connects as well to the Joan Valeri character, Sally Dawson, running the town’s small radio station, which is struggling but sees an opportunity in Autry for a singing sensation. Thortnon will help keep the station afloat if Sally can snare Autry as entertainment, except Autry doesn’t do entertainment for money, see, which leads to schemes to get him on air. Indeed, while “The Old Barn Dance”, as its title suggests, is principally fun and games, you can’t overlook the messages not so much tucked within its tidy plot as laying right there out in the open. Indeed, the tractor v horse subplot is pretty easy to read as a dislike, or at least unease, with the modern world, and the old ways eventually win out, quite literally when Mr. Thortnon and his chief thug attempt to flee Grainville by automobile and Gene Autry chases them down on a horse. It’s a nod toward a more pre-industrial society, not thought out in any great way, just sort of romanticized, as are Gene Autry’s songs which he is intent on singing for free, not signing a contract with Sally Dawson’s radio station, upset when he learns he’s been tricked into being an unintentional shill for Mr. Thortnon’s tractors, really upset when he learns a recording of one of his concerts is being passed off as the real thing. That authenticity is of overriding importance to Autry, an authenticity he sees in performing live and riding horses rather than driving cars. 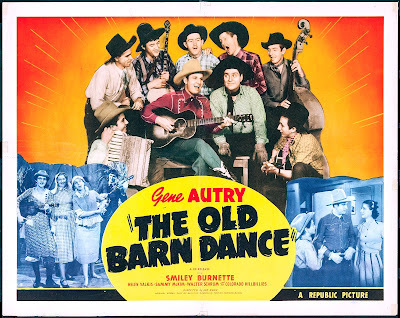 Then again, in the wake of “The Old Barn Dance”, Gene Autry, the one in regular life, that is, found himself in a dispute with Republic Studios over his contract. They were paying him $5,000 a picture; he wanted $15,000 a picture; they balked and he walked. Eventually he returned, after one Roy Rogers was deemed his replacement, with his earnings upped, if not quite as much as he initially demanded. That’s not to cast complete dispersions on Mr. Autry, of course, since we all need to get paid. Still, I suppose it’s a reminder of what movies really are and what movie stars are really like. Gene Autry might be playing Gene Autry but that does not necessarily mean Gene Autry is Gene Autry.